The Hero HD has arrived for the iPad and it’s as grand as ever. The unnamed man in the spandex hero suit is right in the middle of a comic book story and it looks great on the iPad. 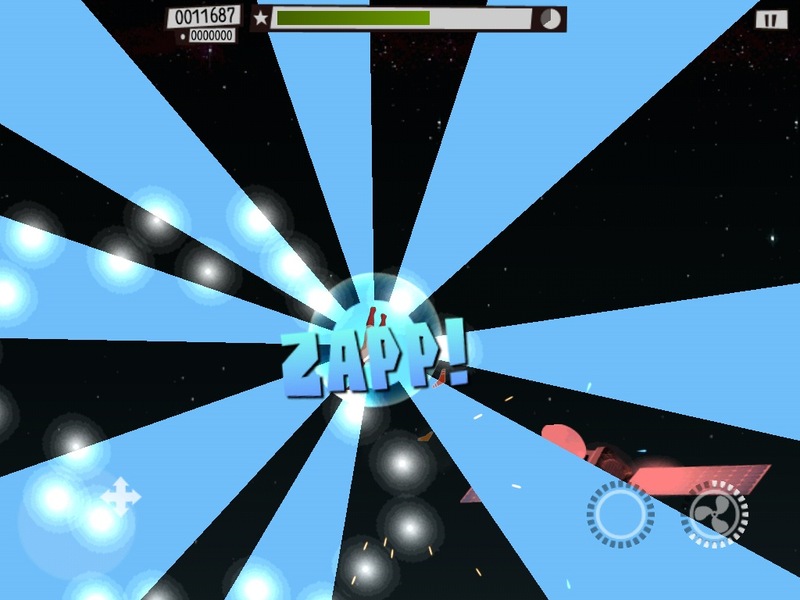 If you’ve ever played the iPhone version of this game you can expect more of the same from this Chillingo title. If you’re hearing about The Hero HD for the first time though, you can expect an entertaining action game with a slightly off kilter sense of humor (in a cute way). As the unnamed superhero it is your job to fly around 15 different settings around the world saving the people in each place/level. A press relations person talk about donuts while offering sound advice before each level and then you’re part of the city. Each level is accompanied with a head nodding soundtrack that will get you fired up like the Ghost Busters theme, and it’s your job to save the world for a bunch of people leaned out of their apartment buildings and yelling for help. Your objectives are two fold. First you want to save the people from spider infestations, bees, ninjas, zombie solders and a series of other bad guy plots (there are 20 enemy types in all). At the same time it’s your job to work your PR wonders by high fiving all the residents hanging from their windows. The summation of this work is all about your fame bar (which is essentially your health based on how well you’re taking care of the town). When your fame runs out your done, but as long as its anywhere on the green to red spectrum you’re still in business as the town hero. The result is a mad rush of flying about in every which way trying to save the world one town at a time. 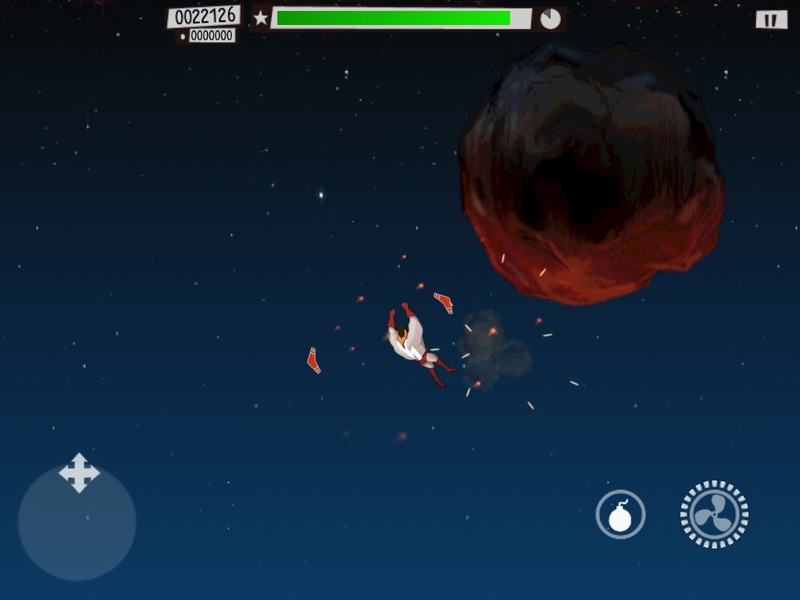 Overall, the experience is great but the controls are very difficult. The game lets you choose between using a traditional directional pad, tilting to steer, or dragging your finger in the direction that you want to fly. I found the finger moving version to be most tolerable, but in every case I never escaped the feeling of being a newborn superhero without the steering skills to ever find precision. The game isn’t impossible and maybe flying isn’t meant to be controlled after all, but in my opinion this is the only thing that’s holding this title back from excellency. Otherwise the superpowers are a nice addition, the game is fun and light, and this is a cute little game that’s difficult to master but simple in concept. Plus, doesn’t everyone dream of saving the day? The Hero HD brings you chance. 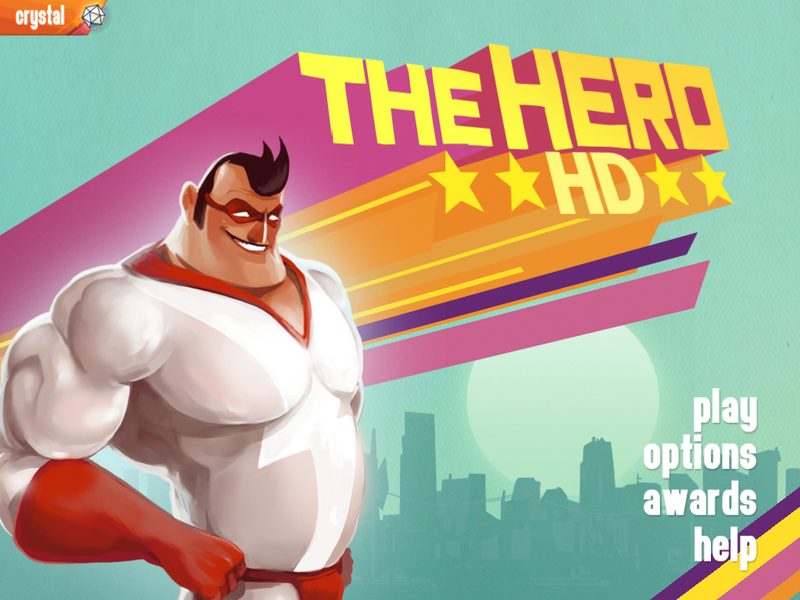 Bottom Line: The Hero HD is a fun and quirky comic style superhero game with great graphics and high velocity gameplay. The controls though, leave you feeling like a newborn superhero with little control no matter how many townspeople you save.